Broncho, cowboy on horse.Wind-up from about 1920 made by Lehman,Germany.Wenn wind up,he will be thrown off the horse.Good condition. 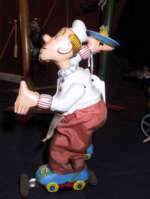 Acrobat from Gely,Germany.The piece is from about 1930 and in very fine condition.On the circus toy the boy is turning arround.Very good condition. Felix the cat driving scooter. Comic. Comic figur made in East Germany about 1950.Wind up.Mint condition.\Size:P 17 cm= 6,5 inch.tin toy. 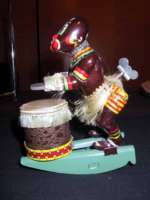 Japanese toy.Black man drumming.Wind up.Ecelent condition. 17 cm = 6,7 inch. Stock/Strauss.German American wind up toy from about 1925.Black man walking down the bordwalk.Size H:18 cm = 7 inch.Very good condition. Lehman tin toy Paak-Paak.7.5" (19 cm.) A tin mother duck with brightly lithographed feathers is pulling a wheeled tin basket with three baby ducklings. When wind up , mama duck walks along, pulling the cart and the baby ducks bob up and down excitedly. Marked Lehmann.Near mint condition, functions well. Comments: Lenmann's EPL model 645, the toy was alternately marketed as Paak-Paak or Quack-Quack, circa 1925. German tinplate toy. Lehmann EPL nr.425.The Stubborn Donkey.Clown. 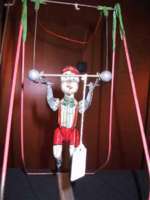 Lehmann Balky Mule.Wind up toy from Lehmann,Germany about 1905.This is the oldest version of The Balky Mule.EPL # 425. Good condition and working fine.L=19 cm/7,4 inch. See Heike Köhler og Katharina Kreschel,Von Störischer Esel zum Kletteraffen Tom.Brandenburger Museumshefte 6,Brandenburg an der Havel 2007. Jürgen & Marianne Clieslik,Ein Jahrhundert Blechspielzeug,München 1981. Helmut Schwarz og Marion Faber,Moving Times,Ernst Paul Lehmann Patentwerk,,History on a Toy Factory,Toy Museum Nürnberg 2003. 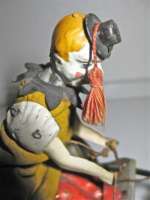 Scating Cook.Japanese mecanical wind up figure.Good condition.17 cm= 7,1 inch.